Auscultation Trainer and SmartScope w/Amplifier/Speaker System. Lung sounds can be detected at five anterior, 10 posterior, and two midaxillary locations. Students can practice auscultation at six anterior heart sites. The remote control does not have to be pointed directly at the manikin or SmartScope™ to operate. One remote control will operate multiple sets of SmartScopes™ and/or manikins simultaneously. Great for group instruction. Listen to the sounds by either using headpieces on SmartScope™ or by connecting to an amplifier/speaker (SB20146U). Range on the unit is up to 100 ft. of remote access. 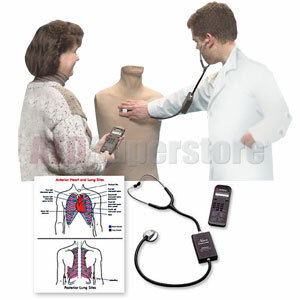 Includes manikin, one remote control with LCD display, and one SmartScope™ with single- and dual-user headpieces, and hard storage case. The Amplifier/Speaker System is a 30-watt amplifier that reproduces sounds with extreme clarity. For group presentations. Complete with speaker and wire connections. AC.